A subscriber to my blog recommended the informative article by Graeme Wood and published in The Atlantic on ISIS. The article entitled “What is the Islamic State?” is lengthy but well worth the read. The article includes many key points concerning the significance of “caliphate” to both past and future actions of the Islamic State, a Sunni Salafi Jihadist group.1 It also stands as an informed and thought-provoking response to the question of whether the Islamic State is Muslim. An important guidance of the article is that to ignore the religious, apocalyptic, goals of ISIS would be a tragic mistake for U.S. policy makers. In fact, the article responds to President Obama’s recent claims that to associate ISIS with Islam is a lie because religions do not kill, maim, and enslave people. Read more. Of interest to me, however, were several of Wood’s criteria about the Islamic State that are also found in Bible prophecy. The key passage is Daniel 11:36 – 45 which has Islamic “identifers” within the verses. However, only the Islamic State criteria mentioned by Wood and also found in Daniel 11:36-45 will be discussed. In my view, they tell us what the future holds for the Islamic State. The Graeme Wood article is based on interviews with supporters and officials of ISIS, including Anjem Choudary, a frequent antagonist on cable TV networks. Choudary, a lawyer and British extremist, has publicly voiced support of ISIS and has even made public his desire to join the Islamic State, but for the confiscation of his passport by U.K. authorities. In conversation, they [Islamic State officials] insist that they will not—cannot—waver from governing precepts that were embedded in Islam by the Prophet Muhammad and his earliest followers. They often speak in codes and allusions that sound odd or old-fashioned to non-Muslims, but refer to specific traditions and texts of early Islam. Read more. “Slavery, crucifixion, and beheadings are not something that freakish [jihadists] are cherry-picking from the medieval tradition,” Haykel said. Islamic State fighters “are smack in the middle of the medieval tradition and are bringing it wholesale into the present day.” … The Prophet, whom all Muslims consider exemplary, imposed these rules and owned slaves. … Muslims can say that slavery is not legitimate now, and that crucifixion is wrong at this historical juncture. Many say precisely this. But they cannot condemn slavery or crucifixion outright without contradicting the Koran and the example of the Prophet. “The only principled ground that the Islamic State’s opponents could take is to say that certain core texts and traditional teachings of Islam are no longer valid,” Bernard Haykel says. That really would be an act of apostasy. Wood quotes Choudary and His colleague Abu Baraa to explain other components of caliphate — the absence of long-term binding peace treaties. Choudary’s colleague Abu Baraa explained that Islamic law permits only temporary peace treaties, lasting no longer than a decade. Similarly, accepting any border is anathema, as stated by the Prophet and echoed in the Islamic State’s propaganda videos. 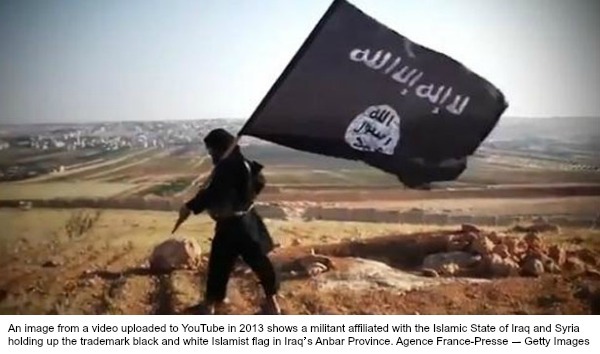 In April 2013, the official spokesman of ISIS, Abu Muhammad al-Adnani, declared the movement of the Islamic State as “ready to redraw the world upon the Prophetic methodology of the caliphate.”(Daniel 11:41-43). In August 2013, he said, “Our goal is to establish an Islamic state that doesn’t recognize borders, on the Prophetic methodology.” According to Wood’s experts, it is critical to legitimacy that the Islamic State not lose control of its territory. If it loses its grip on its territory in Syria and Iraq, it will cease to be a caliphate. 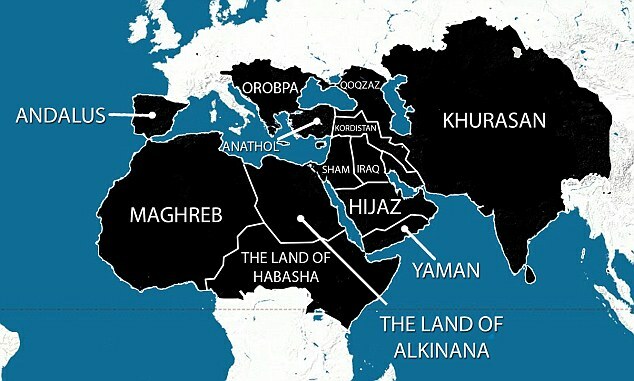 Caliphates cannot exist as underground movements (such as al-Qaeda which has no claim on territory) because territorial authority is a requirement. 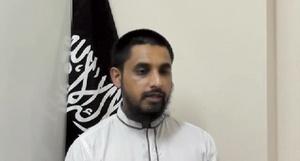 Take away its control and command of territory, and the Islamic State would lose the allegiance by its mujahideen. In fact, without territory there is no Islamic State. The Islamic State’s monthly online magazine, “Dabiq” (Read more) is titled after a prophetic statement made by Muhammad of an end-times battle between the armies of “Rome” and the armies of Sunni Islam. The battle takes place at Dabiq, a small farming village in Northern Syria: “It is here, the Prophet reportedly said, that the armies of Rome will set up their camp. The armies of Islam will meet them, and Dabiq will be Rome’s Waterloo. … An anti-Messiah, known in Muslim apocalyptic literature as Dajjal (the Muslim anti-christ), will come from the Khorassan region of eastern Iran (Iran is a Shia Muslim nation) and kill a vast number of the caliphate’s fighters, until just 5,000 remain, cornered in Jerusalem. (Daniel 11:45). Just as Dajjal prepares to finish them off, Jesus—the second-most-revered prophet in Islam—will return to Earth, spear Dajjal, and lead the Muslims to victory. Lastly, Wood gives emphasis to the Qur’an and hadith upon which the Islamic State is governed. These include the Sunni belief that there will be only 12 legitimate caliphs, and Baghdadi is the eighth. I want to point out some interesting parallels between Daniel 11 and points included in Wood’s article. In Wood’s article there were key statements that are possibly included in Daniel 11, and if these parallels are correct, Daniel 11:45 prophesies the ultimate fate of the Islamic State. The caliphate has an “obligation to terrorize its enemies … with beheadings and crucifixions and enslavement of women and children.” Islam has met this criteria throughout its history. Several prophecy passages mention an extraordinary brutality to be present in the 4th and final kingdom, Daniel 7:19, Daniel 7:23. We find the same brutality present in Daniel 11:36-44. When the Islamic State declared itself the caliphate, it demanded the world’s Sunni Muslims to acknowledge them as such and profess loyalty. Many did, but others did not. Some declared the Islamic State un-Islamic. Captured territory was a key to the acknowledgement of the Islamic State among the world’s Islamist Muslims. The reason is because captured territory communicates the will and favor of Allah among Muslims, in the same way it did in Muhammad’s days. Muhammad was so successful in Arabia that he united the desert bedouin tribes and clans of the Peninsula, something that had never occurred before.3 Likewise, it was not until the acquisition of territory in Iraq and Syria that the declaration of caliphate was made by ISIS. ISIS spokesman, Abu Muhammad al-Adnani stated, “It is incumbent upon all Muslims to pledge allegiance to (him) and support him…The legality of all emirates, groups, states, and organizations, becomes null by the expansion of the khalifah’s authority and arrival of its troops to their areas,” the statement said. Al-Adnani also stated, “It is the caliphate. 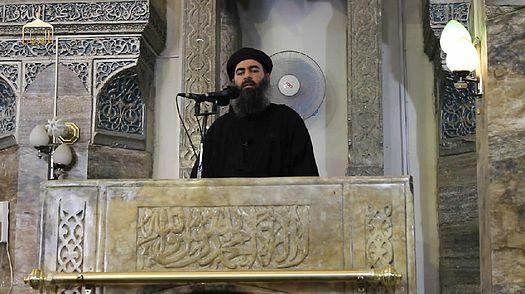 It is the caliphate — the abandoned obligation of the era…We clarify to the Muslims that with this declaration of the caliphate, it is incumbent upon all Muslims to pledge allegiance to the caliph [Abu Bakr al-Baghdadi].” Acknowledgment is not limited to professing agreement on legitimacy but also allegiance, loyalty (Arabic word, bay‘ah). It is important to note the wording of Daniel 11:39: “…he will give great honor to those who acknowledge him and will cause them to rule over the many and will parcel out land for a price.” Two important points in this prophecy — acknowledgment and rewarding of land, i.e., territory, both of which are key to the success and expansion of the Islamic State. A caliphate cannot cease to make war nor can it cease to hold territory. Daniel 11:40-45 includes several references to the antichrist-type leader who gains territory by numerous conquests: verse 40, “… he will enter countries, overflow them and pass through.” Verse 41, “He will enter the Beautiful Land, and many countries will fall; but these will be rescued … Edom, Moab, and … Ammon” (modern-day Jordan). Verse 42, “Then he will stretch out his hand against other countries, and the land of Egypt will not escape.” The point is that it is not one country that is overthrown but numerous, one after the other, and the most significant are mentioned. According to Wood’s experts, Muslim prophecy envisions “Dijjal” as coming from the East to attempt destruction of the caliphate that is now “cornered in Jerusalem.” Applying Daniel 11:44-45 to this prophecy could interpret the prophecy as follows: Iran (Shia Islam, not Sunni) is from the East, and Dijjal comes from the Khorassan region of Iran. Although not mentioned in the Muslim prophecy, Jabhat al-Nusrah, an al-Qaeda branch, is another enemy of the Islamic State, and it is primarily located in Syria, and to the north. Daniel 11:44 describes the enemies of the antichrist-type as from the East and from the North. These two enemies are not destroyed. They only serve to enrage the antichrist-type king and his kingdom so that other peoples are annihilated. Daniel 11:44. ISIS “makes war with great wrath to destroy and annihilate many” and is prophesied to “pitch the tents of his royal pavilion between the seas and the beautiful Holy Mountain;” (Daniel 11:45). That is, this Bible prophecy envisions the antichrist-type king of Daniel 11 to make his headquarters in Jerusalem. Yet “he will come to his end,” and “no one will help him.” This would seem to prophesy that the success of ISIS will include Jerusalem as his capital but will not result in ultimate success for ISIS. ISIS will fall short. Perhaps ISIS’ calls for Muslims to join the Islamic State will eventually fall on deaf ears, by virtue of the inability to defeat those from the East and the North. Hence, the prophecy states, “no one will help him” (Daniel 11:45). If so, this passage could predict the eventual downfall of ISIS albeit after considerable success. I have learned over the years that one can never be dogmatic in interpreting Bible prophecy. Such is the case at present. Nevertheless, there are some key identifiers that are present that cannot be ignored. The Islamic State seems to fulfill the prophecy of Daniel 11:36 – 45. The Islamic State is a Sunni Salifi Jihadist group that will ultimately fail in its jihad. It is my view that Iran, a Shia Islamist group, will ultimately fulfill Revelation 17 and 18, and that Saudi Arabia will be the harlot destroyed by the scarlet beast and her 10 allies; but that takes a whole book to describe. PreviousWhat happens when America tells a lie to win a war? Hi Jack. Excellent post. I believe ISIS has to expand to survive. It has to grow, which requires it to continue warfare at all costs. What will make it grow is its continued success. Similar to how the Arabs were so naively impressed with successes of Muhammad’s army of sycophant followers, as ISIS moves into other countries either through sleeper cells or military expansion out of Syria/Iraq and toward the prize, Jerusalem, it will be seen as more successful. The question is, are Arabs and Middle Eastern Muslim as gullible today as they were in the 7th century? I think the first option is more likely. Sleeper cells and returning ISIS fighters to European, American and other non-Muslim countries are one way ISIS could spread world-wide. I saw a report online that the FBI has admitted ISIS activity in all 50 US states. I believe your hypothesis of Saudi Arabia being attacked by Iran is the most plausible. We should also watch what happens out of Turkey. At least several of the world’s pagan and most idolatrous religions began in Turkey, including the idolatrous Babylonian cult. The bulk of the Euphrates River begins in what is today, Turkey where Pergamum’s ‘satan’s throne’ and also the church of Pergamum is located (Rev 2:12). (Isaiah 27:12) In that day the LORD will start His threshing from the flowing stream of the Euphrates to the brook of Egypt, and you will be gathered up one by one, O sons of Israel. The ‘threshing’ which is a term denoting ‘judgment’. It begins in Turkey (where the Euphrates River begins) and will continue toward Egypt. The entire region from Turkey to Egypt will be judged through warfare as a means of bringing Jews to Jerusalem to repent. At the time of this writing, the Muslim terror group ISIS is being supplied with new fighters through Turkey’s porous border and working their way through Syria and Iraq while Israeli Prime Minister Benjamin Netanyahu has issued an unprecedented summons for all European Jews to emigrate to Israel. (Isaiah 27:13) It will come about also in that day that a great trumpet will be blown, and those who were perishing in the land of Assyria and who were scattered in the land of Egypt will come and worship the LORD in the holy mountain at Jerusalem. Today, many who are perishing (at the hand of Muslim persecutors) in the land of Assyria (Syria) and Egypt are Christians. My initial thought here is that Turkey may absorb ISIS someday, along with ISIS’s gains in Syria and northern Iraq. It may bring its economic and military power to bear in greater measure while sleeper cells and returning ISIS fighters continue to emigrate to western countries and eventually making their way into Israel itself. We know from the scriptures though, that the antichrist, once established near to Jerusalem (Dan 11:45) (but not Jordan), will eventually be destroyed there. If or when ISIS ever makes it into Israel, that will indeed by a very interesting time..to look up. My commentary is coming along, though I have gotten side-tracked with created a series of appendices, including a very lengthy commentary on Matthew chapter 24 among others. It has a very interesting time line of what happens with an escalation of war in the Middle East whether from Islamic State or Iran. About the Euphrates, you said: “The Revelation indicates that war will be waged in Syria and Iraq, beginning with the area around the Euphrates River (Rev 9:14). But it also says Revelation 16:12 (NASB) T”he sixth angel poured out his bowl on the great river, the Euphrates; and its water was dried up, so that the way would be prepared for the kings from the east.” The drying up of the waters cannot be literal for that gains no advantage to the kings from the east in the modern day. But perhaps what the text is saying is that an advantage is given to the kings from the east so that the way is prepared (I see Iran here, rather than Iraq. In OT, Iraq was considered as the nation from the north and Media-Persia was from the east). What if the passage is a metaphor for the gaining of nuclear weapons by Iran? That certainly is an advantage that prepares the way! I have never seen Turkey as a key player even though the 7 churches were all located there. Turkey, once the Ottoman Empire, disbanded the caliphate (probably because it no longer held land that it has lost in WW1). I do not see it as rising up in spite of “Babylon” presence therein. However let us suppose that Turkey is the country from the north in Daniel 11:44. That means that Turkey and Iran are bedfellows against ISIS and it also allows for the fulfillment of Ezekiel 38. Interesting. It’s hard to tell. One verse suggest war begins at the Euphrates (Rev 9:14), while the other suggests a drying up of the Euphrates (16:12). Both could be true, with (Rev 16:12) providing details that (Rev 9:14) lacks. On the question of literal or metaphor for (Rev 16:12), I’m open to a metaphorical interpretation, but one can only imagine what “drying up” would be signifying. Perhaps an elimination of power or influence? A literal drying up is possible too, given that there are dams along the Euphrates which could be bombed. Iran already has a (small) contingent of troops assisting Iraqi forces fighting ISIS, not big enough to be threatening to anyone, nor I think to be of prophetic significance. But this could change. They are there under the pretense of ‘training Iraqi forces’, but even the US has played that game. I don’t see Iran and Turkey uniting, one being primarily Shiite, the other primarily Sunni. Turkey is already allowing fighters to go through its very porous border to join ISIS, so I think Turkey is letting ISIS do the dirty work and may clean up later after ISIS is weakened or spread out. This may inflame Iran’s aspirations of regional expansion and lead to a territory war with the Sunni/Shiite conflict being a motivating factor as well. It is unlikely that Shia Iran and Sunni Turkey unite, I agree. But look at Ezekiel 38:5-6. Persia is, of course, Iran. Gomer is Turkey. As unlikely as that seems, the Ezekiel alliance is prophesied to include it. Yes, you’re right Jack. It sure looks as if there will be a hostile force including an allied Iran and Turkey at some point. Seems odd that Iran would attack Saudi Arabia (which is Sunni) but ally with Turkey (which is also Sunni) ?? Perhaps those events are separated by a significant time period?